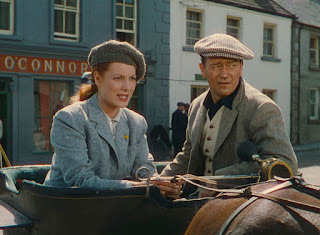 A romantic comedy set in rural Ireland, The Quiet Man features John Wayne and Maureen O'Hara in fine form as two headstrong individuals destined to be together. But the film also suffers from slow pacing and an oversaturation of local Irish flavours. Sean Thornton (Wayne) arrives back in his birth town of Inisfree, Ireland, after turning his back on a boxing career in the United States. Sean buys back the home where he was born from the widow Sarah Tillane (Mildred Natwick), a transaction that annoys his boorish neighbour Will Danaher (Victor McLaglen) to no end. Sean sets his eyes on Will's resolute and fiery sister Mary Kate (O'Hara), a stunning red head, and becomes determined to win her heart, but the perpetually angry Will does all he can to block the relationship. For personal reasons Sean avoids a physical confrontation with Will at all costs, and is instead helped by the local townfolk, including Father Lonergan (Ward Bond) and wagon driver Michaeleen Flynn (Barry Fitzgerald), to succeed in his pursuit of Mary Kate despite Will's protests. But Mary Kate herself has preset and traditional ideas about her self-worth, and even when Sean thinks he is making progress in his domestic life, he is surprised by local customs and forced to seek an unconventional resolution with Will. Directed by John Ford as a celebration of his Irish roots, The Quiet Man is an amiable-enough film that is easy to enjoy. Filmed on location in Ireland, the scenery is lush, the Winton Hoch cinematography brings out the best of the landscape, and the romance elements find the cozy space between comedy and drama. There is just enough background story and character development to keep things reasonably interesting, and the central characters of Sean and Mary Kate carry sufficient edge to generate sparks. And it's good to see John Wayne in a sturdy role that doesn't require a gun. Mary Kate's quest for a sense of self-empowerment while still respecting traditions is an engaging theme. She is devastated when Will blocks Sean's attempt at courtship, but cannot bring herself to disobey her brother. She is further demoralized when Will withholds the cash portion of her dowry. The money is not the issue, but the symbolism of independence matters, and Sean will need to prove that he cares enough to fight for her dignity. The liberated sensibilities sit uneasily next to some dated scenes featuring Mary Kate being roughly manhandled by Sean, his physical impositions portrayed as the normal demands of a well-meaning but impatient lover-to-be. 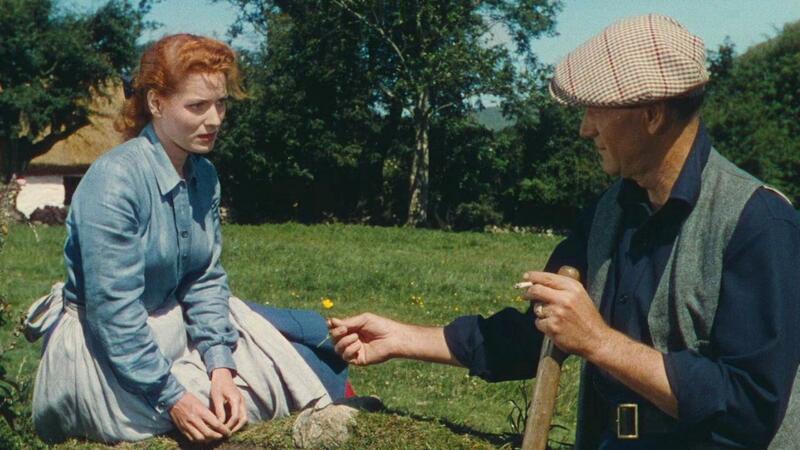 At 129 minutes, The Quiet Man does go on. The actual plot is quite thin, which is no surprise given that the source material is a short story that appeared in a magazine. Ford pads the running time with plenty of local colour. In a case of seasoning trying to cover for the absence of substance, there are a few too many secondary characters, and all of them are jovial Irish locals with a love for vivid outfits and of course frequent stops at the pub. There are also several tedious Irish songs, and quite a few scenes drag on well after the point is made. This all leads to the climactic fist fight, a prolonged, genuinely funny across-the-fields bout between Sean and Will that goes on for about 20 minutes, complete with a drinks intermission at the pub. The fight injects some much needed energy and jolts the film back to life. The Quiet Man is decent if a bit mundane when he adheres to his title, but better when his fists swing into boisterous action.